Improve safety around your metal buildings, and protect people from the elements, with a building canopy from Metallic Products. Built to stand up against extreme wind speeds and snow loads, our affordable building canopies are made to last. Even better? With a range of colors and finishes available, your canopy will blend in well with your metal building. Click below to learn more about our canopy designs and specifications. Already Have a Metallic Products Canopy? 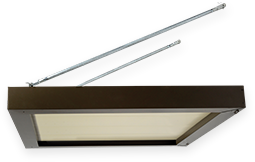 Transform it into a lighted personnel door canopy with a retrofit kit!